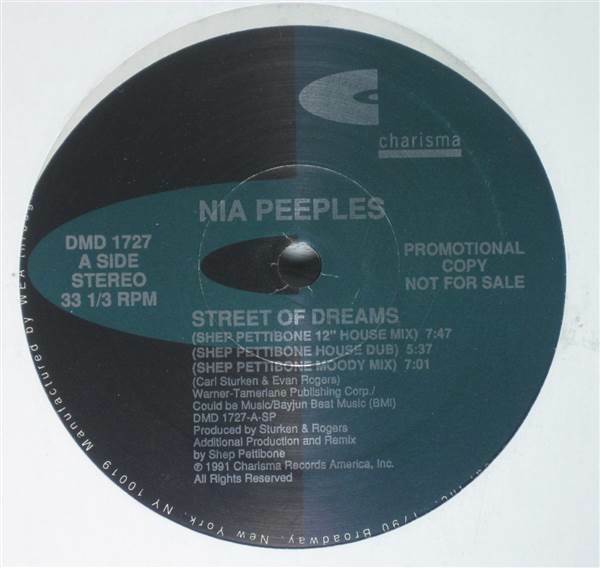 Nia Peeples - Street Of Dreams 12"
HOUSE, Charisma, USA, 1991... Street Of Dreams (Shep Pettibone 12" House Mix), Street Of Dreams (Shep Pettibone House Dub), Street Of Dreams (Shep Pettibone Moody Mix), Street Of Dreams (Shep Pettibone 12" Mix), Street Of Dreams (Shep Pettibone 7" Mix). Dax Riders - People 12" Mr. Roy - Show Us Your Meat Hole 12" Do It! - Carico, Carico, Carico 12" Bastone & Burnz Feat. Triple Lexxs - Horny All The Time 12"